Today the Coptic Orthodox Church farewells a member of its Holy Synod, a faithful monk, a respected scholar and theologian, and above all a beloved father figure and friend to many around the world. The late Bishop Epiphanius was found dead outside his cell at St Makarius monastery on 29 July 2018, and while the cause of death is unknown, this tragic loss of life will bring sadness to the hearts of countless members of not only the Coptic community, but to ecumenical friends and acquaintances around the world. Bishop Epiphanius was born on 27 June 1954 in the Tanta Governorate in Egypt. 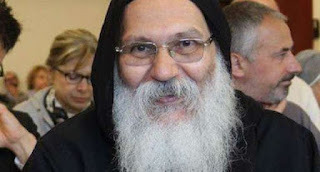 He graduated from the Faculty of Medicine, and joined St Makarius monastery on 17 February 1984, becoming a monk on the 21 April of that same year. He became a priest on 17 October 2002 and was ordained a Bishop on 10 March 2013. As Abbot of the monastery, Bishop Epiphanius was well-respected by his peers and was known for his forward thinking and spiritual aspirations. He specialised in Church history, patristics and the translation of Arabic texts into English in order to promote Christian education worldwide. The funeral for Bishop Epiphanius was held in the Monastery of St Makarios on 31 July 2018, officiated and attended by His Holiness Pope Tawadros II, 118th Pope of Alexandria and Patriarch of the See of Saint Mark, members of the Holy Synod of the Coptic Orthodox Church and clergy from the monastery.